My daughter can’t talk yet (in a language we can understand), but no doubt once she learns to use words, one of the most challenging parenting lessons will be teaching her what truth is, what lying is, and why you should always tell the truth, no matter who you’re talking to. Of course the old adage reminds us, “If you always tell the truth, you’ll never have to remember what you said.” Exactly. Dishonestly builds upon itself until eventually we have no option but to unravel our entire whopper and come clean (this is in fact a universal truth that applies to everyone at all times everywhere, outside of Washington, D.C.). We could have saved time, energy, and frustration if we’d just told the truth. Your life doesn’t need dishonesty. Rarely does it stop with one lie. Read any children’s book about the subject and you’ll see that trying to cover up the bad test score or broken lamp only amounts to more lies and confusion and Mom or Dad is never happy with the outcome. In essence, then, nothing has changed since childhood. What you didn’t need in your life then you don’t need in your life now. Stop lying in any form – to yourself or to others – and you you won’t have to keep track of what you’ve said and to whom you’ve said it. You’ll then spend less time worrying what it was you said and if you’ll be found out. Truth, even as absolute as we’d like to make it, still has a gray area. Because truth can encompass facts and data as well as life lessons and wisdom, it’s a big tent under which many ambiguities can hide. What about telling the truth, but not the whole truth? Or what about those things that are true, but not factual (the lessons we learn from myths of childhood stories and fables, for example)? How do we know when we’re being completely honest since honesty itself can be defined so many different ways, made up of so many disparate parts? Not to mention the white lies that don’t hurt anyone and don’t seem to build upon themselves. Telling someone they don’t look fat in a certain dress or that someone will find Mister or Miss Right if they just keep trying causes much less harm than the brutal alternative of no-holds-barred honesty. Philosophers and ethicists have written volumes about this concept, but I think we can all benefit by remembering that we can always use less dishonestly in our lives and much more truth. Choose appropriately. Best of all, when you commit to being honest and getting dishonesty out of your life, you’ll begin to be more honest with yourself. This is important to finding your passion. If you don’t love something or something doesn’t feel right, you needn’t lie to yourself that it does, you can simply admit it. You don’t want to find yourself down the road several miles when you should have never made that turn to begin with. You’ll know if a certain interest or passion really appeals to you. Admit to your self when it feels wrong – and when it feels right – and you’ll be sure to find that passion that is yours and worth pursuing wholeheartedly. The people (who voted…more on that later) have spoken. The midterm elections of 2010 are mercifully past resulting in a new Republican majority in the House of Representatives and a smaller majority for the Democrats in the Senate. Now, to those of you that know me, the fact that I lean leftward in my politics is not a new revelation. However, many of you don’t know that the direction of my current political leanings is pretty much polar opposite of my youthful right wing past. I’m not writing about that change today. But that is the context that I bring to this discussion. I didn’t watch the returns last night. Instead, I continued my trek through Season 1 of 30 Rock via Netflix. I awoke this morning, dropped today’s edition of the New York Times onto my Kindle, and read the story I expected to read at the top of A1. I was not really troubled at all about the results of yesterday’s elections. “They are what they are” as they say. A friend of mine (a fellow liberal) posted that “sanity lasted for about 3 days” on his Facebook status…an obvious nod to Stewart/Cobert’s Rally to Restore Sanity and/or Fear held on the national mall this past Saturday. I don’t believe he was referring to the election results. I think he was referring to the rhetoric coming from the collective windbags we either elected or kicked out of office and/or the pundits of the TV news channels pretentiously “explaining” the results to all us littles. His next sentence pretty much sums up the soil from which my cynicism flourishes: “I am not expecting much cooperation in the next two years with continued fighting resulting in an extended weak economy and the poor continued to being trampled.” I really don’t know what actual work will be accomplished by this congress. But I’m hoping my friend is not prophetic and my cynicism is dashed. However, the trend is not hopeful. Sanity is probably still an idealistic dream. I’m pretty sure what we’ll see over the next two years is a change in roles…the Dems wearing the hats the GOP have worn for the past several years…that of a ball and chain around the process. God forbid the other party actually getting credit for accomplishing something. It is a testament to the sad state of our two reigning political parties. 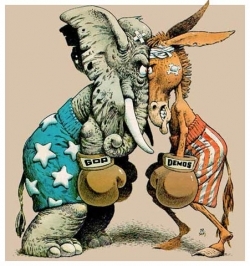 Democrats and Republicans actually share a common objective: gain control for the party. The thought of working together to accomplish something bigger than any one political party could ever do on its own is written off as simply naive. I’ll not pass a blanket judgement on that 59% for that lapse…their reasons are their own (be it apathy, not registered, disenfranchised, etc.). But I would like to say that it is my hope that the mandate of the month might be informed by the idea that our nation is not merely a democracy of majority rule but one where it is safe to be in the minority (People much wiser than I have said that somewhere before but I can’t find the exact quote…please add it to the comments if you can attribute it to someone). All of us are Americans. Liberals, conservatives, Democrats, Republicans, Independents, rich, poor…all of us. Is it too much to ask that we all work together to solve the problems facing our nation? I’ll leave you with a little Bill Moyers. (and for those who would like to claim the title “Christian Nation” for these United States of America…please meditate on this passage of scripture). Although our interests as citizens vary, each one is an artery to the heart that pumps life through the body politic, and each is important to the health of democracy.